A triangle is the simplest two-dimensional figure and is one of the strongest in nature. The world is made of triangles, from honeycombs to bridge trusses. Three is a magic number in many ways beyond the familiar Bob Dorough song popularized in the TV series Schoolhouse Rock, including within the Scouting movement. 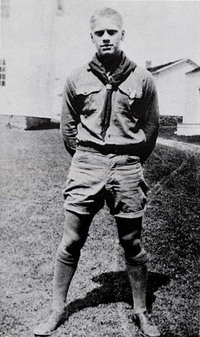 This past week, Bryan Wendell, Scouting Magazine’s editor, posted on his blog an item about the Scouting triangle from Scouter Michael Dulle, likening it to the triangle of fire. In the triangle of fire, you need to have fuel, oxygen and ignition. If any one of these is missing, you can’t have a fire. His Scouting triangle consists of youth, program and trained adults. Same thing – if a side goes missing, the movement falls apart. Take Scout advancement. Three elements are essential: The Scout learns, the Scout is tested and the Scout is reviewed. (The fourth element, the Scout is recognized, puts the ribbons on, but advancement is complete following the review.) Without all three happening, advancement doesn’t take place either. Youth protection is another area where the number three figures prominently. Our dealings with youth are never one-on-one; there must be at least one other person (a Scout buddy or another adult) within view and close by. Our Scouts are also taught to recognize, resist and report as part of child abuse prevention programs such as It Happened to Me or A Time to Tell. The unit Key 3 consists of the unit leader (Scoutmaster or Cubmaster), the committee chair and the chartered organization representative. These three people must work together in order for their unit to be successful. The chartered organization representative sometimes is thought of as the seat of a three-legged stool, where the three legs are the unit, the chartered organization and the district. The chartered organization representative ties them all together and provides a path for them to communicate and work with each other. 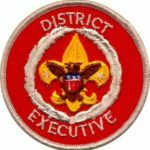 Each district has a Key 3 as well, representing the branches of the district: the district committee, led by the district chair; the commissioner corps, led by the district commissioner; and the professional staff, led by the district director or executive. The committee provides membership, finance, and program support; the commissioners are the unit-service resource; and the professionals provide overall guidance, BSA policy and administration. Likewise, councils have a Key 3 that perform much the same functions, only on a council-wide level. 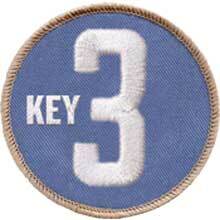 There are area, regional and national Key 3s as well. There are other triangles that support Scouting and I’m sure you can think of several. One such is the triangle that supports and individual Scout: his family, his community (church, school) and his troop or pack. Scouting is financially supported by Friends of Scouting, with family, service organization and business/corporate arms. Even the elements of our program come in threes: our Scout Oath speaks of duty to God, country and self, helping others and taking care of oneself. The points of the Scout Law are grouped into duty to others, to self and to God. The Order of the Arrow is all about brotherhood, cheerfulness and service (WWW). And Cub Scouting has the Tiger, Wolf and Bear who guide our youngest members as they progress through the ranks. Triangles are found all around us – in the outline of our tents, in the tripod that holds our cooking pot over the fire, and perhaps most fundamentally, the shape of our neckerchief, the defining uniform element of our movement. So next time you see a triangle, think of the triangle of fire and how it puts the flames of life and passion into the Scouting movement. Just about all of us figure in as one side of one of the many triangles. Be aware of the importance of your role in Scouting and don’t let your triangle fall apart. Bryan Wendell may have published the triangle but it is my original design and narrative. I would appreciate you give credit where credit is due. Happy to do so! Thanks for the insightful concept and for sharing it with us. Previous PostPrevious Sharpen your saw!